Motherhood Imperfected: Get a Melissa & Doug 25% Off Coupon When You Take the North "Poll"
Melissa & Doug want you to tell them which of their educational toys you think is the best! I know a lot of you are big fans of their toys, as we are, so I wanted to share this with you! Just click on the image below to place your vote in the North "Poll!" 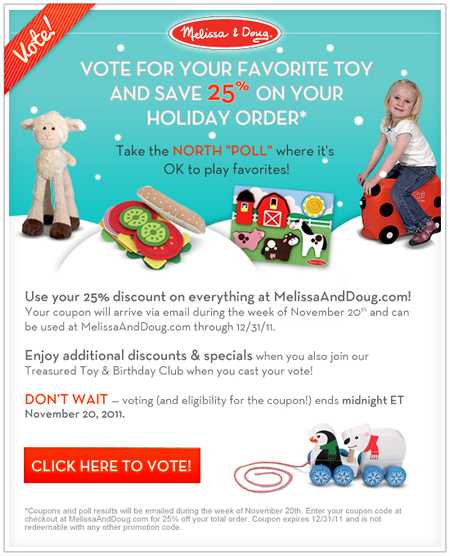 You'll Get a Melissa & Doug 25% Off Coupon to use at MelissaAndDoug.com just for voting!